After drenching south Florida, Tropical Storm Gordon moved into the eastern Gulf of Mexico and is headed to the northwest. NASA's Aqua satellite found three areas of the strongest storms east of Gordon's center when it passed overhead on Sept. 4 . Infrared satellite data on Tuesday, Sept. 4 at 4:05 a.m. EDT (0805 UTC) from the Moderate Resolution Imaging Spectroradiometer or MODIS instrument aboard NASA's Aqua satellite revealed several strongest areas in Gordon where cloud top temperatures were indicative of strong storms and heavy rainmakers. In those areas, MODIS found coldest cloud tops had temperatures near minus 70 degrees Fahrenheit (minus 56.6 degrees Celsius). NASA research has found that cloud top temperatures that cold have the capability to generate heavy rainfall. At 5 a.m. EDT (0900 UTC), the National Hurricane Center or NHC noted "The storm has a small CDO [central dense overcast] with convective banding features primarily over the eastern semicircle of the circulation." It is in the eastern semicircle where Aqua found the strongest storms. 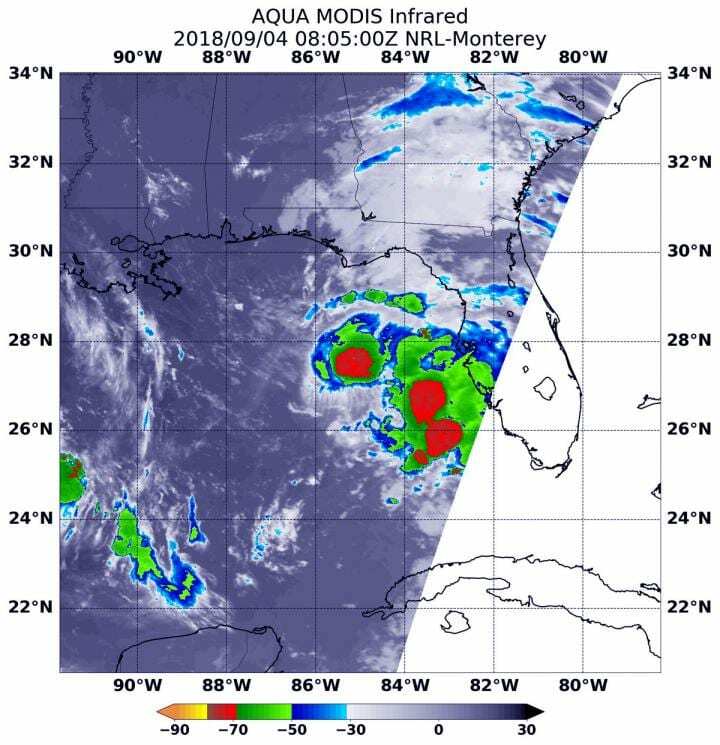 At 8 a.m. EDT (1200 UTC), the center of Tropical Storm Gordon was located near latitude 28.1 degrees north and longitude 86.2 degrees west. That's about 190 miles (305 km) east-southeast of the mouth of the Mississippi River. Gordon is moving toward the west-northwest near 15 mph (25 kph). A west-northwestward to northwestward motion with some decrease in forward speed is expected over the next few days.